significant observations and data regarding any aspect of the biology of arachnid groups. authors. Use the active voice throughout. welcomed and will be subject to the same review process as all other submissions. preferably in compatible format. Large plates and figures may be sent as pdf or jpg files. electronically to the Associate Editor. months for major revisions) will be considered new submissions. the top of the title page. author(s) or geographic region(s) emphasized, may be included. not duplicate words in the title. Text – Double-space text, tables, legends, etc. throughout. Three levels of heads are used. Thefirstlevel (METHODS, RESULTS, etc.) is typed in capitals and centered on a separate line. geographic coordinates for collecting locales if possible. Citation of references in the text: Cite only papers already published or in press. 1986, 1987; Jones, et al. 1989). when it first appears in the manuscript. full unabbreviated journal title. Personal web pages should not be included in Literature Cited. Philodromidae) from M. P., India. Rec. Zool. Surv., India. 97(3): 191-193.
from Jabalpur, M. P., India. Geobios, 18(1): 13-16. Vairale, A.B. and Vankhede, G.N. 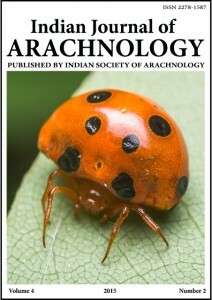 (2010): Diversity and ecology of spiders in Satpuda. Ph.D.
Thesis, Sant Gadge Baba, Amravati University, Amravati pp 346. Gujarat. Zoos. Print Journal 18 (11): 1259 -1263.
reference to spiders from agro-ecosystems. 6-18.
manuscript page. Tables and figures may not have footnotes. Tables – Each table, with the legend above, should be placed on a separate manuscript page. instead, include all information in the legend. submitted, preferably in tiff or jpeg format. Distribution maps should be considered figures and numbered consecutively with other figures. and reviewers can view figures effectively. figures. If possible, send entire manuscript, including figures, as one Microsoft Word document. available from the same website. omitted. Short communications must include an abstract and keywords. if selected will be duly acknowledged.